She may not have actual speaking lines during her debut in the 1953 Peter Pan film, but Tinkerbell has made audiences fall in love with her sassy nature ever since. She is known as Peter Pan’s magical and constant companion, and usually does magic with the help of her fairy dust. Tink is also known for her light green fairy dress and beautiful fairy wings. She loves putting her blonde hair up in a bun, and pairing her dress with light green ballet flats. Here’s everything you need to look like Tinkerbell. 1 Light Green Tank Top If you can’t find the perfect Tinkerbell dress, you could always use this tank top as a part of your costume. 2 Light Green Layered Skirt Pair the tank top above with this light green layered skirt for a beautiful fair effect. 3 Light Green Fairy Wings As a Neverland fairy, you need to make sure that you have adorable fairy wings. 4 Light Green Ballet Flats Pair up your light green ensemble with this equally light green ballet flats. 5 Blonde Updo Wig It might be easier to get Tink’s hairstyle if you wear a wig. 6 Fairy Wand Do a ton of magic with fairy dust and a fairy wand. 7 Infant Costume Set Put your little baby in this adorable Tinkerbell costume set. 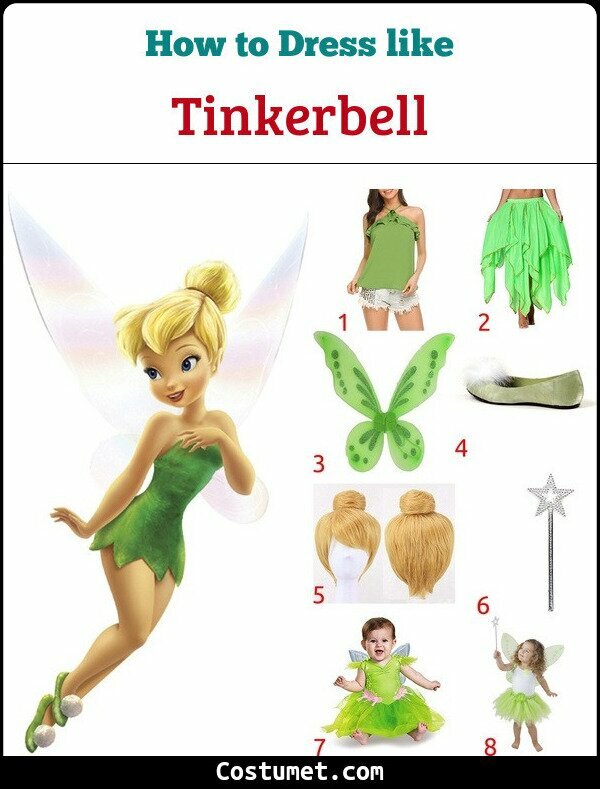 8 Toddler Set Your rambunctious baby girl can become Tinkerbell with this costume set. 9 Girls Costume Set Even little girls can still be pretty fairies in this costume set. 10 Full Costume Set You can also transform into the sassy Tinkerbell in this costume set. Although she didn’t have any speaking parts in the original 1953 Peter Pan film, a few actors have already voiced this little fairy. At present, she is being portrayed by Mae Whitman. Wendy Darling’s outfit in the 1953 Disney film adaptation is very simple. She’s wearing a light blue Edwardian-era night gown with a light blue ribbon tied on her hair.